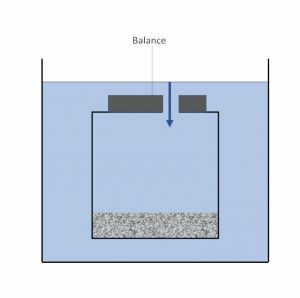 Bulk volume changes: how do well conditions affect the bulk volume changes of cement and what are the consequences for zonal isolation? Expanding agents: how can they be used to improve zonal isolation? This absolute volume decrease is referred to as chemical shrinkage, total chemical contraction or hydration volume reduction. As an example of how to calculate chemical shrinkage we can take the example of the early hydration of calcium trisilicate (C3S). To calculate the chemical shrinkage, we need to know the densities of the tricalcium silicate, calcium silicate hydrate and Portlandite. These values are given in the paper by Pierre Mounanga, Abdelhafid Khelidj, Ahmed Loukili, Véronique Baroghel-Bouny, “Predicting Ca(OH)2 content and chemical shrinkage of hydrating cement pastes using analytical approach,” Cement and Concrete Research, Elsevier, 2004, 34 (2), pp.255-265. Similar calculations can be performed for the other cement phases as described in the paper cited above. Chemical shrinkage occurs in other hydrating systems including plaster, lime and calcium aluminate cement and also occurs with the hydration of “expansion additives,” such as magnesium oxide, used in some oil well cementing slurries. In all these cases chemical shrinkage cannot be avoided, but the negative consequences of the chemical shrinkage can be minimised or eliminated. Complete hydration of 1 mole of MgO gives a volume reduction of 4.9 mL: 12.3 mL/100g. Expressed in terms of volume reduction per mass of starting material this is twice the chemical shrinkage of C3S, yet MgO is used as an “expanding” agent. We will see in the next article why this is the case? The principle of the measurement of chemical shrinkage is easy, but experiments must be performed carefully to obtain correct results. See for example ASTM C1608 – 17 “Standard Test Method for Chemical Shrinkage of Hydraulic Cement Paste”. The diagram on the left shows a basic setup to determine chemical shrinkage. 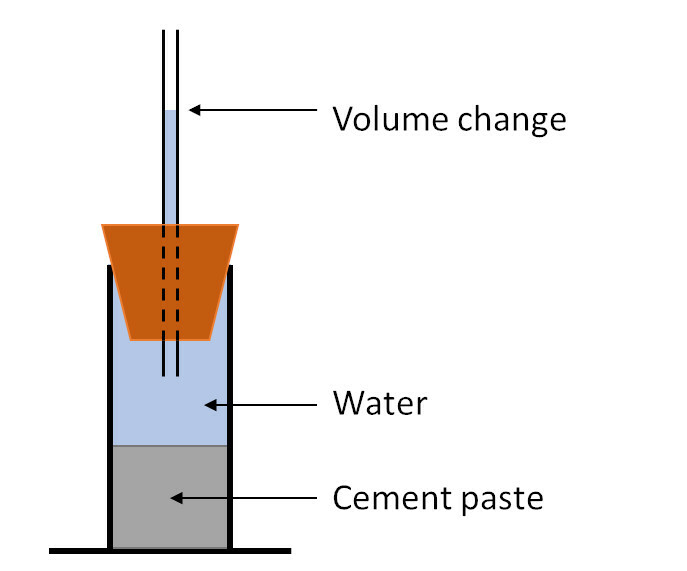 A cement paste is mixed, and a known mass placed in a container. The container is closed with a tube with volume graduations and the whole system filled with water. As the cement hydrates the volume reduces and the drop in the water level indicates the volume reduction. This is the dilatometry method. 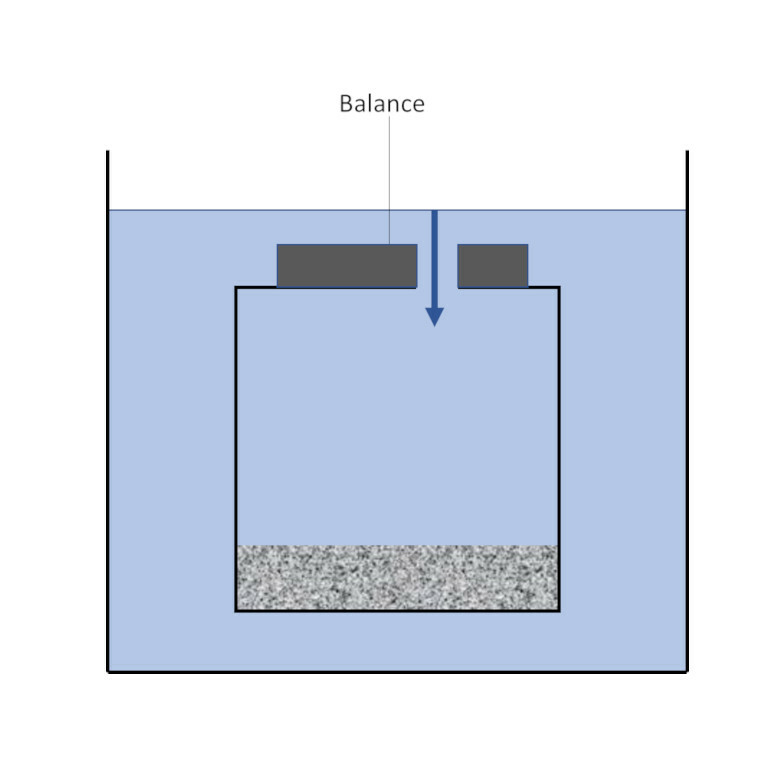 A variation on this method is to place the whole assembly on a balance and to maintain the water level constant by adding water, the volume of which is indicated by the increase of mass. This is the pycnometry method. A variation of the pycnometry method is to suspend the entire assembly from a balance in a container of water . In this way the water level is maintained at a constant level and the increase in mass can be monitored continuously from the balance. Temperature: a variation in temperature will create changes in the volume due to thermal expansion or contraction. The test setup must be housed in an environmental chamber to minimise temperature variations. Container shape: a wide bottomed vessel such as an Erlenmeyer flask is preferred for several reasons. There is a larger surface area available so there is more contact between water and the cement paste. Thickness of the cement paste. 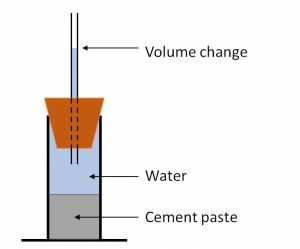 To allow penetration of water into the entire cement paste the the cement paste should be between 5 and 10mm thick. If water doesn’t penetrate entirely into the cement paste, then the chemical shrinkage will be underestimated. The cement slurry and water must be air free – they should be de-aired prior to addition to the equipment. The water to cement ratio (w/c) of the slurry should be optimum – 0.4 is suggested by the ASTM method. If the w/c ratio is too low, it may be difficult for a homogeneous paste to be made and for water to be able to penetrate the entire paste during hydration. If the w/c is too high, then there may be bleeding of the cement paste leading to inhomogeneities.